MainAll NewsForeign AffairsAnti-Israel Ambassador to Replace Falk? Anti-Israel Ambassador to Replace Falk? UNHRC under pressure from Arabs to appoint Indonesia's former UN ambassador as expert to probe Israel's conduct towards Palestinian Arabs. Richard Falk, the UN’s “human rights expert” who probed Israel's conduct towards Palestinian Arabs and was known for his history of anti-Israel statements, is stepping down after serving his maximum term. His likely replacement, however, appears to be just as bad. The Geneva-based UN Watch monitoring group exposed on Wednesday that a U.S. academic was vetted to become the next human rights monitor. However, under pressure from Arab states, the UN Human Rights Council (UNHRC) president is planning to reject her appointment and instead appoint Indonesia's former UN ambassador, Makarim Wibisono. Despite a unanimous recommendation submitted to the president by the UNHRC's five-member vetting committee, Arab states have threatened to veto the appointment of Georgetown University law school lecturer Christina Cerna, revealed UN Watch. UN Watch also raised “serious questions” about Wibisono's satisfaction of the post's objectivity requirement. In addition to representing a government that rejects any official diplomatic relations with Israel, Wibisono went to Gaza in 2010 to meet with the leader of the Iranian-backed Hamas terrorist organization, noted UN Watch. Wibisono has also demonstrated a disconcerting pattern and practice of "one-sided and inflammatory" statements. For example, he has accused Israel of “unconscionable use of force against the Palestinians,” "untenable acts of aggression," and of having a "policy of retribution against the entire Palestinian nation." Wibisono openly embraces what he calls the "sacred Palestinian cause." "The real issue is not the nominees, but the biased position itself," said UN Watch executive director Hillel Neuer. "This is the only council mandate that requires the examination not of a given region but of only one side, with the specific instruction to investigate 'Israel's violations of international law' in the territories, while completely disregarding human rights abuses against women, Christians, and dissidents that are being committed by Hamas, Fatah, Islamic Jihad or others," he added. Last week, Falk accused the Jewish state of a campaign of ethnic cleansing and apartheid policies, the latest in a series of anti-Israel statements made by him. He has in the past compared Israelis to Nazis and publicly called on the UN to investigate and potentially expel UN Watch. 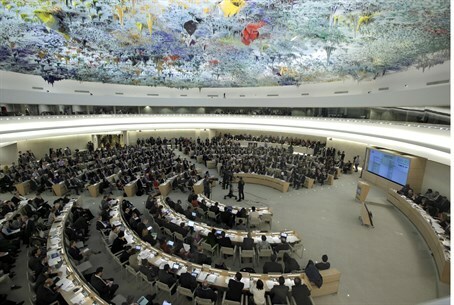 Israel recently returned to the UN Human Rights Council following a two-year absence, after Western countries finally agreed to admit Israel into their caucus. For decades Israel was the only country at the council excluded from any of the council’s five regional groups. The UNHRC has consistently singled out Israel for criticism while allowing into its ranks countries with questionable human rights records, including China, Russia, Algeria, Cuba, Vietnam and Saudi Arabia.